Poo Pourri has launched “Imagine Where You Can Go”, a music video inspired by choreographed musicals, following on from hugely popular commercials in 2013 (Girls Don’t Poop) and 2014 (Santa Claus). Performers sing through all the uncomfortable places you can now confidently GO with Poo~Pourri, like on a date or at the office. 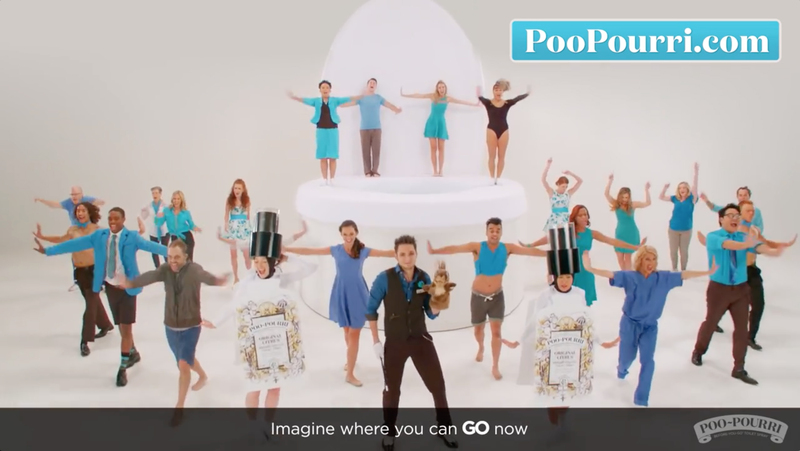 The music video introduces a new dance move, “Do The Poo~Pourri,” inspired by the steps of going number 2. The dancers exude confidence as they own their you-know-what and are able to freely GO wherever the wind takes them. The vision and concept were developed in-house at Poo Pourri by Suzy Batiz, founder and CEO, creative director Nicole Story, story and design team Hector Batiz, Will Clarke, Kirsten Gold, art directors Lindsey Juckem and Paola Cortez, working with lyricist Jeff Lewis and composer Chris Sernel. Filming was shot by director Cameron Duddy (Mark Ronson and Bruno Mars’ Uptown Funk) via Artists and Derelicts with director of photography Tom Banks, producers Peggy Moore and Jessica Cramer, choreographer Sara Von Gillern, wardrobe team Kirsten Gold, Gay Horman and Annie Cox. Editor was Adam Henderson at Post Op Editorial. Visual effects were produced by Mike Jensen. Post production was done at Republic Editorial by colourist Nick Mueth and sound mixer D. Hayes Smith.